A proper security system is no longer a luxury reserved for large businesses. 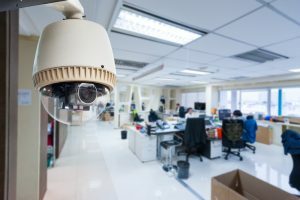 With more options available on the market, having video surveillance is more and more common for small businesses. Once you have your security system in place, ensure you make any potential intruders aware that there is a system. A robber is less likely to target a residence if they notice security cameras or signs. Businesses can follow this example and inhibit criminals from striking by advertising their security measures. Ensure you have signage about your security system at every entry and exit point. Open reception spaces, broken elevators, and unsecured fire stairwells can give perpetrators the chance to get into and potentially access your workplace. Regularly check on these areas to identify if there are vulnerabilities and ensure to correct any on your property as soon as possible. Majority of intruders enter businesses through the doors and windows. Check these continuously. Employees are often your eyes and ears when you aren’t present. It is important that all your employees are on board with protecting your business and are knowledgeable about your safety and security procedures. Promote interest in the business’ safety and security by involving your team in the planning process for these procedures. Give them an opportunity to provide input and feedback to help give them a sense of responsibility. Schedule regular safety refresher sessions on workplace security for your staff and include in-depth training during orientation for new employees. Provide an opportunity for employees to anonymously report any issues they have seen in case they do not feel like they can publicly speak about something they may have witnessed. While there is a major emphasis on preventing a potential intruder from entering the office, preventative measures can be taken to minimize theft and damage should someone get in. The easiest place to start is by reminding employees not to leave valuables items out in the open or in places that are easily accessible. Lock all paperwork, especially if it contains any sensitive information, in filing cabinets. Keep any paper paperwork that needs to be shredded in a discreet, secure place. Get your team into the habit of checking and locking doors and windows if they are staying late. The time invested in taking workplace safety and security pays off in the long run. If implementing safety policies and procedures for your business seems overwhelming, consider bringing in an expert for risk management consultations. Contact Impact Security Group to learn more about our risk management consultations and our corporate security services.